FIGURE 11.1 Structure of rhodopsin. A: Crystal structure model. Helices are labeled I-VIII. 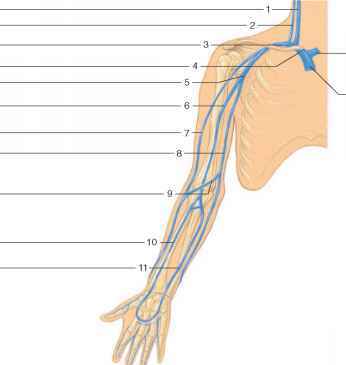 Loops connecting the helices are labeled C-I, C-II, C-III and C-tail for the cytoplasmic side and N-tail; E-I, E-II, and E-III for the extracellular side. Glycosylation, retinal and disulfide bond are represented by sticks. B: Secondary structure model. Helices and beta sheets are marked by gray boxes and arrows, respectively. The disulfide bond between Cys187 and Cys110 is indicated by a dotted line and labeled with an arrow. All ten cysteines in rhodopsin are highlighted with circles. C-terminus, binding of the all-trans retinal ligand, and detailed conformational changes upon photo-activation.5 Recent applications of atomic force microscopy to analysis of the conformational changes and folding dynamics of bacteriorhodopsin have also been reviewed elsewhere.6 Although bacteriorhodopsin has provided extensive information about the 7TM structure, it is not a true GPCR, lacking the ability to mediate the signal transduction events with downstream G protein signaling pathways. The only GPCR for which information about the 7TM structure is directly available is bovine rhodopsin. First, a low resolution structure was derived by electron microscopy,7 followed by determination of the x-ray crystal structure for the inactive state8 (Figure 11.1A). 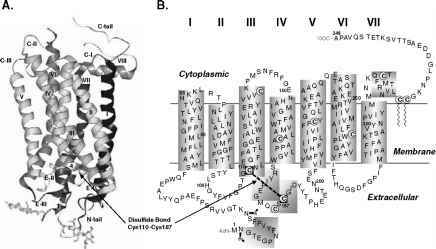 Thus, rhodopsin, has proven to be a model par excellence for structural and functional analyses of GPCRs. The ligand in rhodopsin, 11-ds-retinal, is covalently attached to the protein via a protonated Schiff base to the e-amino group of Lys296 located in TM7 (Figure 11.1B). This gives rise to a characteristic absorption at 500 nm. Activation of rhodopsin is achieved by light: capture of a photon by rhodopsin results in isomerization of 11-cis retinal to the all-trans form that triggers a series of transient changes in the protein accompanied by characteristic absorption changes: dark rhodopsin (500 nm) ^ batho (548 nm) ^ lumi (497 nm) ^ meta I (480 nm) ^ meta II (380 nm) ^ meta III (450 nm) ^ opsin + free retinal (380 nm).9 Only the meta II conformation can promote the activation of the G protein, the hallmark signaling event of the GPCR family. This chapter will present the current state of knowledge of the structure and dynamics of rhodopsin in its dark conformation and in photo-intermediates, along with reviews of past and present state-of-the-art applied methodologies and in reference to other GPCRs in the ligand-free and ligand-bound states, where possible.